Canon's Ixus 230 may look like most other high-end point and shoot digital compact cameras, but it comes complete with a myriad of exciting features, including a 12 megapixel camera and rechargeable Li-ion battery. With the Ixus brand - which includes the Canon Ixus 300 and the Canon Ixus 310 - carrying a comprehensive manual feature set and super-slick great photographic results, we were soon bowled over by this great manbag-friendly camera from Canon. For a compact pocket-sized camera the Ixus 230 manages to fit in an abundance of manual features, from on-trend lomo effects such as Toy Camera and Fish Eye to useful modes for capturing low-light scenes -these work particularly well, giving scenes a warm and natural glow. There's also a fireworks mode, particularly handy as we tested the Ixus 230 over Bonfire Night. However, navigating this wide range of features can prove confusing. You have to go quite deep into the menus to begin properly adjusting settings, using the normal compact cam wheel of five buttons. There are shortcuts for the things you'll find yourself most often fiddling with, such as flash. The top-mounted wheel control for the 8x zoom is impressively smooth and the Auto mode can ably pick the best settings for you if you're in too much of a hurry to delve into settings. The three-inch screen is bright and crisp. Essential icons appear on screen when shooting so that you can instantly check your settings and, once you hold down the shutter, face detection does a fine job of framing your pics. This is one fast snapper. There's no delay, from switching the camera on you can shoot instantly and the automatic focus will stabilise your pics in a trice. Hold down the shutter for a split second to ensure focus is correctly set and you're guaranteed classy, quick results. The Ixus 230 also offers a high speed burst mode, ideal for capturing sporting events, it takes up to 8.7 shots per second. The rechargeable Li-ion battery will keep snapping for up to 210 shots. The Ixus 230 will certainly last a full day and night before needing to retire. With Canon wisely choosing to keep to 12 megapixels and concentrating instead on its HS system, with the powerful DIGIC 4 processor, pictures are of a very high standard. Leave everything up to the Auto mode and you'll rarely be disappointed. When the HS system really shows its class is when shooting in low-light. In these conditions the Ixus 230 really shines, able to take beautiful shots at high ISOs with minimal image blur. Start experimenting with the many creative modes on offer and results can be elevated further. 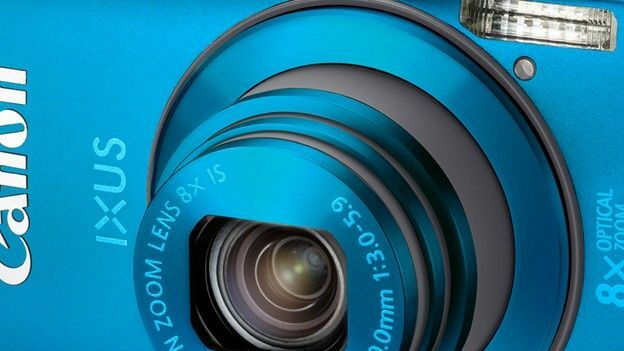 The Ixus 230s 8x optical zoom is a big selling point and is exceedingly effective. Zoom right in on a subject however and blur is almost inevitable. Canon has included a tripod mount – a rare addition for a compact camera – on the bottom for a reason. Video capture is available in full HD 1080p and the results are of a high standard. Handily you can use the zoom when filming and the Ixus 230 ensures that panning in and out is smooth; you can hear the operation of the zoom which is picked up by the mic, but it's not overpoweringly noisy. The Canon Ixus 230 is at the higher end of the compact camera market, costing over £200, but for that outlay you get the option to truly experiment with your shots. This is more than just and point and shoot, handbag cam – although, it does have the slimline charms, lightweight feel and wide choice of colours. There are options available with more tech treats, whether that be a touchscreen or the ability to send photos directly to Facebook and Twitter, but if you're looking for a gimmick-free compact that concentrates purely on taking great shots, the Canon ixus 230 is a fine choice.